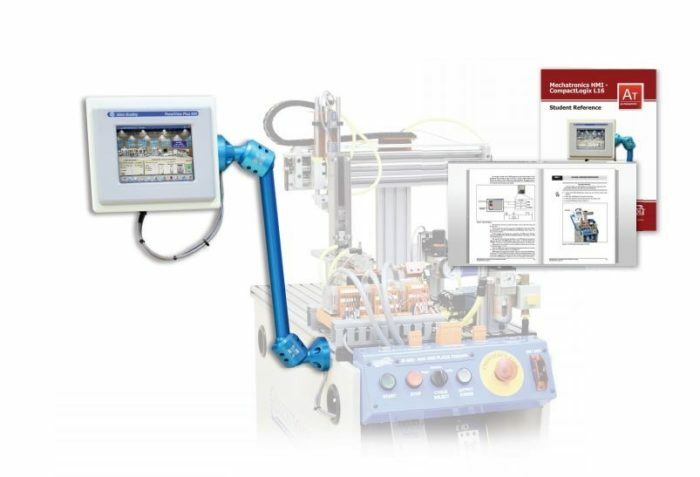 Amatrol’s Mechatronics HMI Terminal Learning System – CompactLogix L16 (87-HMIAB53A) teaches learners how to use a human-machine interface (HMI) to control and monitor an automated line. Used in conjunction with Amatrol’s 870 Mechatronics stations with Allen-Bradley CompactLogix L16 programmable logic controllers, this HMI terminal training system will teach current or future machine operators, maintenance technicians, and supervisory personnel how to use an HMI to control and monitor the status of a machine or process. The system features a PanelView Plus 600 HMI with a 6” screen, an HMI terminal module, an Ethernet cable, and a workstation pedestal mounting module. Also included are an Instructor’s Guide, an Installation Guide, and a three-part Student Learning Activity Packet containing a comprehensive curriculum focused on relevant HMI knowledge and hands-on skills. The curriculum is also available in an optional eBook format. Flexible and feature-rich, HMI panels allow machine operators, maintenance technicians, and supervisory personnel to control and monitor the status of machines and processes on automated lines. As technology has advanced, HMI panels have replaced traditional hard-wired operator inputs and outputs in virtually all mechatronics control and/or monitoring applications in most industries around the world. This HMI terminal training system represents Amatrol’s ongoing commitment to bridging the skills gap with technical training tools backed by robust curriculum materials that focus on the hands-on skills required to thrive in today’s advanced manufacturing environments. Amatrol’s in-depth curriculum seamlessly weaves together theoretical knowledge with hands-on skills to solidify understanding and create a strong basis for pursuing more advanced skills. The HMI terminal training curriculum teaches learners about the construction, operation, and configuration of an HMI panel, the operation of FactoryTalk View Studio — ME software, and application editing topics, such as application displays, input and output objects, and numeric input/output. After studying these topics, learners will then practice hands-on skills, such as configuring communications settings, connecting an HMI to a network, transferring an integrated project, and operating an HMI panel. The HMI terminal training system can be integrated into any of Amatrol’s mechatronics learning systems for HMI control and monitoring. These advanced mechatronics systems bring real-world industrial components into the classroom and help to build a broad array of job-ready skills in integrated technologies. Learners can make precision physical adjustments and program the systems to assemble a minimum of four different variations of directional control valves. A sample copy of the HMI terminal training system Student Reference Guide is also included with the system for your evaluation. Sourced from the system’s curriculum, the Student Reference Guide takes the entire series’ technical content contained in the learning objectives and combines them into one perfectly-bound book. Student Reference Guides supplement this course by providing a condensed, inexpensive reference tool that learners will find invaluable once they finish their training, making it the perfect course takeaway.